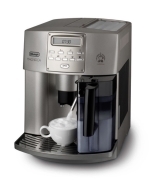 alaTest has collected and analyzed 125 reviews of Delonghi EAM3500. The average rating for this product is 4.0/5, compared to an average rating of 4.4/5 for other products in the same category for all reviews. Reviews about the design and size are generally positive. The maintenance and usability are also mentioned favorably. Some have doubts about the performance and reliability, and there are some mixed comments about the capacity and durability. We analyzed user and expert ratings, product age and more factors. Compared to other products in the same category the Delonghi EAM3500 is awarded an overall alaScore™ of 77/100 = Good quality. It really is easy to clean and makes a cappuccino precisely to my (very demanding) spec. Takes up quite a bit of space on the work surface but no more than other machines. Very quick and easy to make a good quality cappuccino with minimum effort due to clever design - espressos are even easier. Easy to change the 'qualities' of the finished drinks with minimum effort (i.e. quantity and strength). Easy to clean and maintain. The water reservoir and the bean store could both be a bit larger and thus require less frequent filling - but this is a quibble rather than a criticism.